BROCKHAUS STEEL Cold Rolling Mill stands for the production of rolling products with the closest possible thickness tolerances and an excellent surface finish. Given an entry thickness of 16 mm, we achieve fine blanking qualities over the whole thickness spectrum starting at 0.8 mm. Rolling is a forming process in which steel is deformed between two or more rotating rolls. If the deformation takes place above the recrystallization temperature, it is called hot rolling; otherwise it is called cold rolling. Cold rolled steel strip is characterized by a cross-sectional reduction of at least 25%. In cold rolling, the deformation takes place through force of the rolls supported by adjustable strip tension in both coilers and decoilers. These support the cold rolling process so that the setting force of the rolls can be reduced. Depending on the intended use, the strip has to be annealed after cold rolling. This step is done in the above mentioned batch annealing. After the annealing process, the material is rerolled. 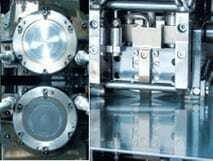 In this process, the material is deformed with little rolling force and little reduction. Through this, the material obtains a smooth, clean surface with a low surface hardening.